JO ON FOOD, LIFE AND A SCENT OF CHOCOLATE: Cannabis Lab, Instapot, Infectious Disease Clinic. Cannabis Lab, Instapot, Infectious Disease Clinic. It seems fated that every time I have an appointment at the Cannabis Lab either the weather, or my body, stops me. What annoyed me today, I had my urine sample ready to go, but was eyeing the roads with some trepidation when ring goes the phone and they said the lab was closed due to the weather. Basically freezing rain was the big problem today. I was planning to go get some more smoked haddock and sausages, but decided, although not far, that too was unwise. Oh well, next time. I have placed a grocery order for tomorrow so I am hoping it will all be OK weatherwise. Been looking at Instapots today, a really unexpected gift is being sent to me from a cyber friend who, with her husband, wants to buy me one. I am not sure what I have done to earn such a marvellous present, but I am absolutely delighted. You know who you are, and you have my undying gratitude. I will really enjoy using it. I will have to dispose of a couple of things, like my slow cooker, which was, anyway, far too big and cumbersome. I received my appointment for the Infectious Disease Clinic today. At least the mail workers were on duty. However, tried to phone the clinic and they were not there. I will try and get a ride to the Clinic which is in part of the hospital where I recently spent such a delightful time!!!! Not sure what the point is when I am, to all intents and purposes, all better now. I like flank steak, it is tasty and inexpensive although, unless cut right, can be a tad tough. This includes a Chimichurri Sauce, I have never made one, but have eaten it in Portugal and this recipe doesn't seem it would produce the fiery, mouth searing, lip stripping sauce I experienced in Portugal. Maybe that's not a bad thing. As for the asparagus, it is still too early for the good stuff but I saw some reasonable asparagus in the Victoria Street Market (smoked haddock place) which might work. I tried making cauliflower rice once, it was pretty good and certainly quite healthy. flavor. This dish is easy enough for a weeknight dinner but delicious enough for date night or a dinner party. 1. Preheat grill to medium-high. To prepare chimichurri sauce: Chop parsley and garlic together until finely chopped. Transfer to a small bowl and add vinegar, 2 tablespoons oil, ¼ teaspoon pepper and ? teaspoon salt. Stir to combine. To prepare cauliflower rice: Heat 1 tablespoon oil in a medium skillet over medium heat. Add cauliflower, scallions, ? teaspoon salt and chipotle. Cook, stirring, until tender, 4 to 5 minutes. Remove from heat; cover to keep warm. 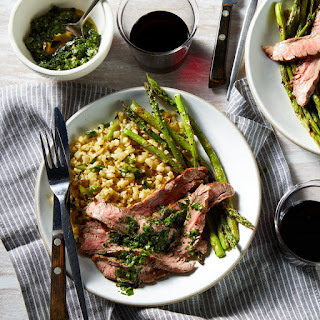 To prepare steak & asparagus: Toss asparagus with oil. Sprinkle the asparagus and steak with salt and pepper. Grill the steak for 5 minutes. Turn the steak and add the asparagus to the grill. Cook, turning the asparagus once or twice, until the asparagus is tender and the steak is cooked to your liking, 4 to 6 minutes more for medium rare. Let the steak rest for 5 minutes before slicing. To make ahead: Refrigerate chimichurri sauce for up to 2 days. You're stuck at home today? What will you do? Better safe than sorry though. I think I can go out today Alex, yesterday was really bad though. We have fog and ice today. Never got warm enough yesterday to melt the ice and more snow is coming. I HATE winter. Stay home and stay safe. Gotta get my shopping Denise. The roads are clear today so it should be OK. Only a short journey anyway. My instapot has a slow cooker setting, so you can toss the slow cooker without worry. Instapot also makes the meat more tender, so flank steaks can be cooked without worry. Weather is always a wild card here too. Right now, we are dealing with flooding. Yes Liz, the one I am getting does too. It also makes yoghurt, of all things? Today was pretty mild, roads clear as a bell. I've never heard of an instapot. We were in the low 80's today. You surprise me Diane, they are all the rage. They are a modern form of a pressure cooker but heaps better I understand. I hate you, low 80s, grooooooan.